A reimagining of the line delivers aesthetic, performance and comfort improvements to this 62-footer. An optional third steering station is in the cockpit, to starboard. With joystick control, it may be handy for backing into a slip but good visibility is only to the aft starboard corner, making the station’s appeal somewhat limited. Steps lead up both sides to sidedecks where the cabin top has been angled inward, providing more shoulder room to walk forward. A sunpad takes up most of the foredeck but here, Prestige rethought things. Although the pad is triple-wide, both sides have room for an unobstructed skylight, which bring light into the forward stateroom. A cabana at the head of the pad provides shade, and a four-seat forward-facing settee is at the foot. The settee seatbacks can be lowered to make the sunpad even larger. 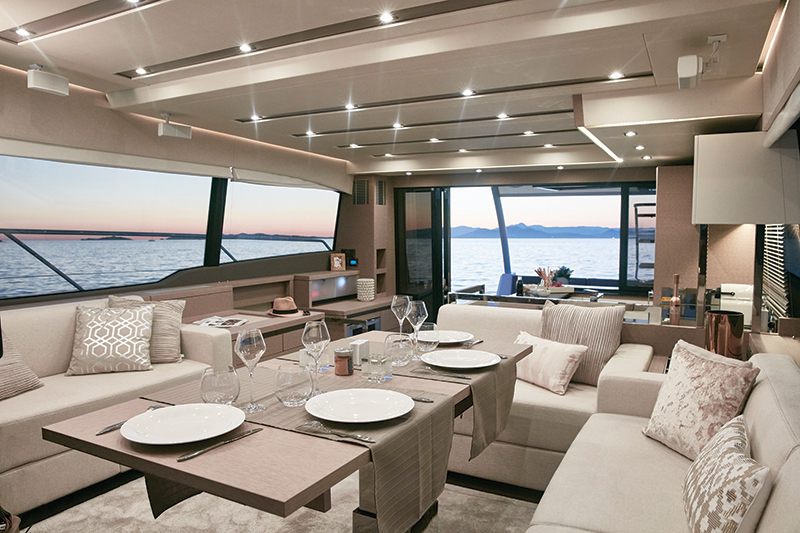 From the cockpit, six steps lead up to a massive full-sized flybridge. Its molded fiberglass helm console sits to port and is positioned behind a windshield. Here, I found twin 16-inch MFDs, and with a bit of rearranging a third could be added. The Volvo Penta pod joystick is outboard and to the left, which initially seems counterintuitive for right-handers. In use, however, it does allow the driver to pivot outboard to see the length of the vessel as he docks and manages the stick with his right hand. Nice. The entire starboard forward corner is dedicated to a sunpad large enough for a small army and a double seat that mirrors the one at the helm. 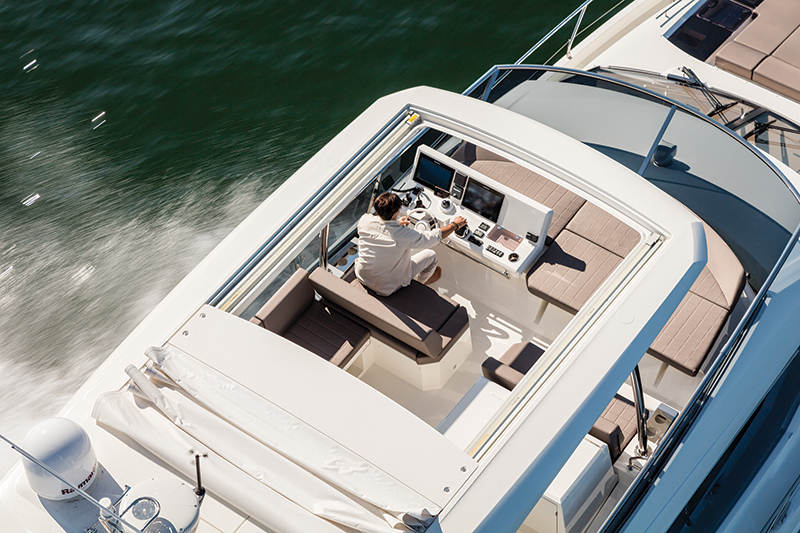 From these seats aft, the flybridge is protected by the hardtop and its integrated fabric sunroof. An L-shaped settee is aft and wraps around a solid wood table to create a delightful alfresco dining area. 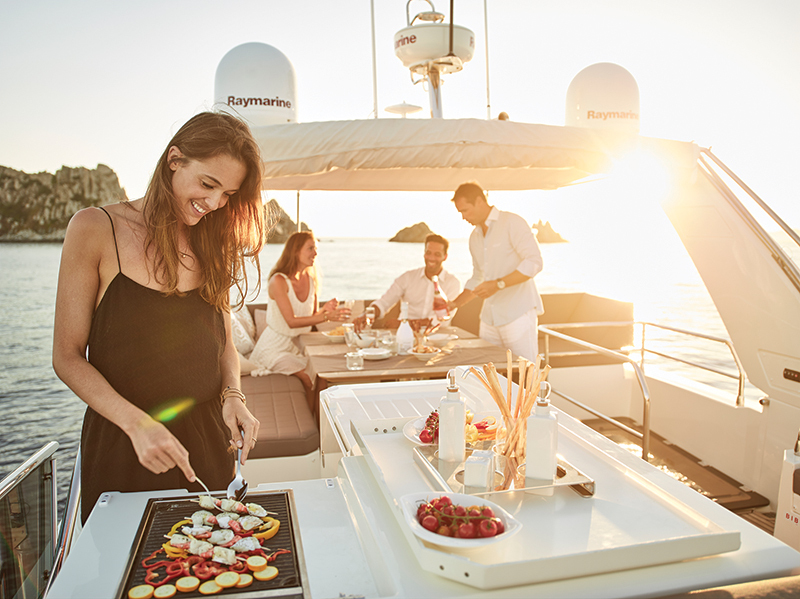 An outdoor galley amidships includes a small Kenyon grill, a Dometic refrigerator and plenty of worktop space. The module lid opens to reveal a bottle holder — more good thinking. 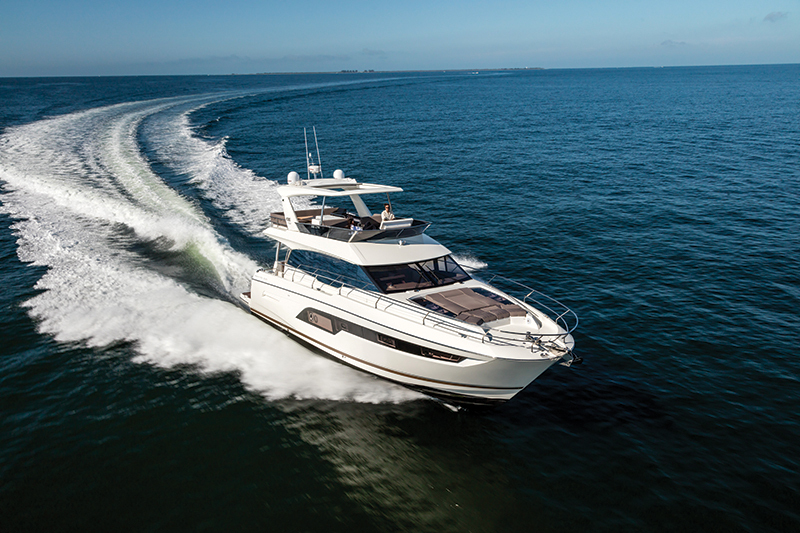 The 630 comes in a flybridge and a sport model. 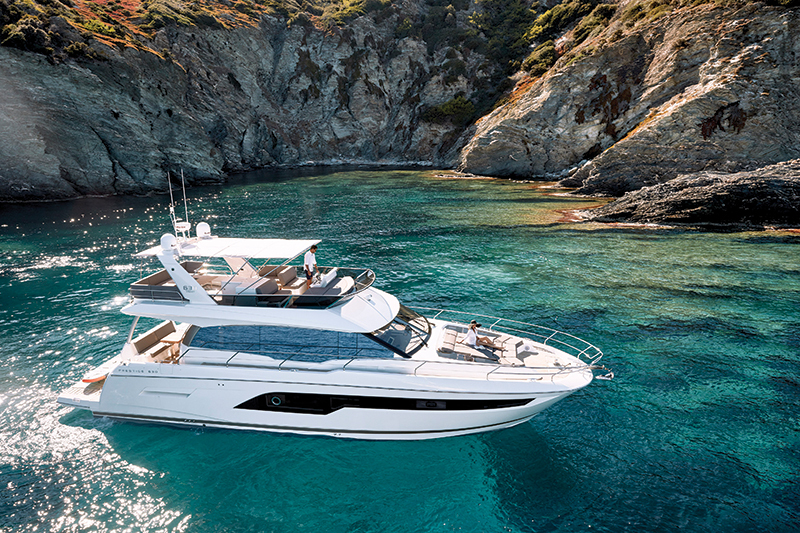 The latter calls for the flybridge to be shortened and pushed aft, which allows the addition of a sunroof in the salon but still accommodates a smaller outside social area and a second helm up top. Prestige’s signature divided floor plan has the master stateroom aft, which is accessed via its own staircase. It’s a standout feature that owners of other models in the line love, if only for the feeling of being on their own mini-superyacht — an oxymoron, yes, but the privacy and separation can make anyone feel special. Stowage capacity is exceptional in two large hanging lockers and drawers throughout. The headroom and the length of the master berth are both six and a half feet, for tall boaters’ comfort. As always, Prestige has added touches of luxury where it counts, including a 60-inch flat-screen TV and a backlit, fabric-covered headrest that provides a soft glow throughout the cabin. The master head to starboard has an extra-wide sink integrated into the Corian counter and a compact shower stall. 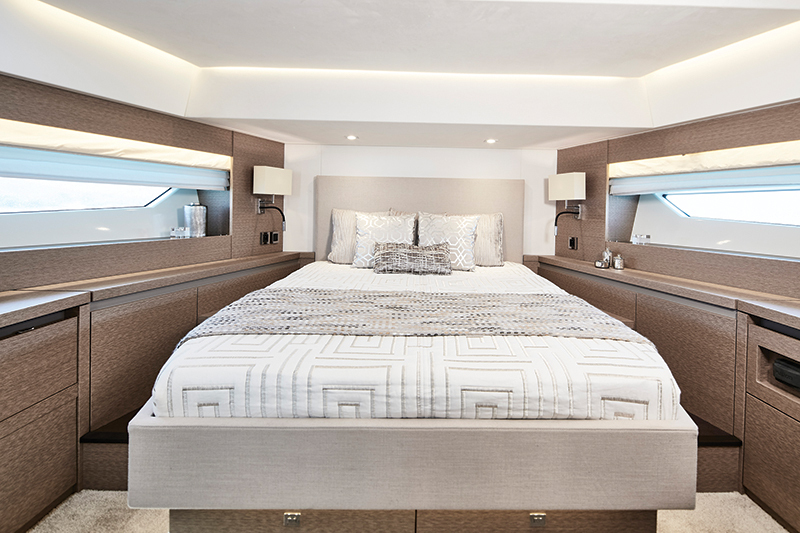 While the cabin stretches more than 16 feet across the full beam, it is a bit shorter fore and aft, as space seems to have been allocated to the accommodations in the forward section of the boat, including two guest cabins that are fully en suite. Of course, the VIP cabin in the bow runs a close second to the master. As mentioned before, plenty of light and air pour through the overhead hatch and skylights, but there are also hull windows and opening ports, so the cabin is light and breezy. Another vanity desk (same issue with its height) is to port, and the head is en suite; a separate door makes it the day head too. Upstairs on the main deck, the galley is aft and to port, so it can easily serve the interior dinette and anyone in the cockpit. Cooks will appreciate the convenience of a ceramic three-burner Bosch cooktop and a separate Miele oven at knee level. A standup refrigerator/freezer combo is hidden behind matching wood paneling, and an optional Edgestar dishwasher is down low in the aft corner. A center island holds dishes, including tiny espresso cups in individual cutouts. Inboard of this island is a very useful leather-covered handhold, matched by another a few feet forward on the galley counter. The salon is one step up, which raises it enough so anyone seated gets a perfect, near-360-degree view through windows that were made longer to let in more light. Prestige has been enlarging the windows throughout the line, which is aesthetically more appealing and may offer the hidden benefit of putting everyone more at ease, even those prone to seasickness. The helm, to starboard, is well laid out. 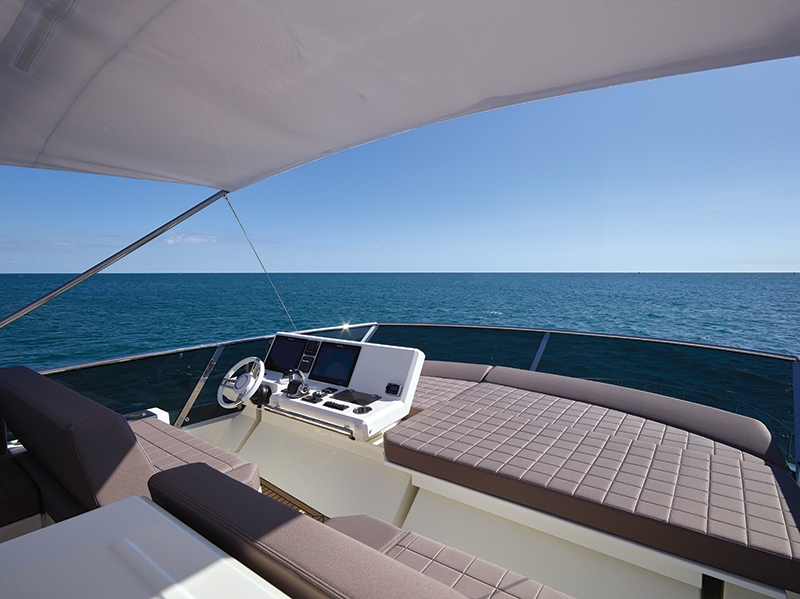 Three 16-inch Raymarine gS165s MFDs sit on the dash behind the wheel at an angle that minimizes reflection off the windshield. The touchscreen displays also have a control panel that could be mounted a bit closer to the driver, so he can reach them from a seated position. The MFDs are easy to see but the Volvo-Penta EVC display, which sits flat on the dash, has lots of reflection from above, so drivers might have to lean down for a closer look. Or just repeat the engine information on one of the MFDs. The pod joystick, bow thruster joystick and engine throttles are all outboard beneath the side window. Both port and starboard windows may be opened by switches at the helm. 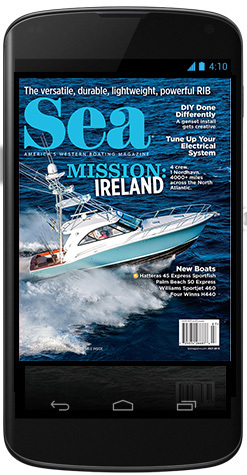 The VHF radio is outboard and forward, so it’s out of the way, but rocker switches at knee level create two issues: you can accidentally activate them with your knee, and you have to tuck your head down to see which one is which. Two cupholders are inboard of the wheel, which is handy but it would be nice to add a dedicated smartphone pocket to keep things organized. The dash is covered with a matte paint that cuts down on glare, and the well-placed footrest and double helm seat offer driver comfort on extended trips. The Bayport Yachts crew — David Schaefer and Erik Mayol — and I conducted our run up the coast from San Diego Bay to Newport Harbor at a cruising speed of 22 knots (2200 rpm), with a light breeze of 10 to 12 knots on a flat ocean (1-foot chop) — a very pleasant couple of hours. 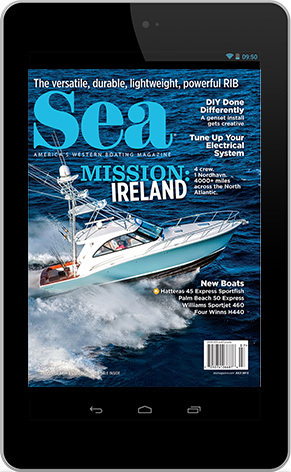 At the yacht’s cruising sweet spot, right at 22 knots, the Volvo diesels achieved 0.37 mpg, and with 713 gallons of fuel that gave us an approximate range of 235 nautical miles, with a 10 percent reserve. At 2000 rpm our speed was 17.7 knots and fuel burn was 46 gph, for a range of close to 250 miles. At wide-open throttle, slightly more than 2500 rpm, we just nudged 28 knots, at which point the IPS950s were burning a combined 75 gph. Before we left San Diego, we tested the time to plane on the flat waters of the bay — a neat 8.3 seconds. Not that the conditions warranted it, but we ran with the Seakeeper activated and the ride was smooth as silk. I always start a test in the engine room, so I completed a thorough walkthrough before we took off, while the engines were still cold. On the 630, the engine room is accessed via the swim platform. The exterior door opens to optional crew quarters — twin berths and a small head — that also serve as the walkthrough to the machinery space. Twin 725 hp Volvo Penta IPS950s are coupled with pod drives, a combination that delivers better fuel economy and greater performance with less horsepower and overall weight. A 21.5 kw Onan genset is on the centerline forward, above the optional Seakeeper gyrostabilizer. To either side are twin fuel tanks with sight gauges and dual Racor filtration systems. There’s excellent access to all systems except the pod drives, which are reached via the crew quarters. We made ourselves comfortable at the helm for the 90-mile run and I noted, once again, how quiet the Prestige line is — hardly a creak to be heard, even at speed. The hard-chine hull has a deep entry but then tapers off to a 16-degree deadrise aft and was designed to accommodate Volvo Penta IPS pod drives. Despite the 630’s ample proportions, the pods will make anyone a pro at docking, keeping station while waiting for a bridge to open or when picking up a mooring. LOA: 62 ft., 4 in. Beam: 16 ft., 10 in. Draft: 4 ft., 11 in. Twin 725 hp Volvo Penta IPS950 engines w/pod drives, Onan 21.5 kw genset, flybridge hardtop, bow thruster, swim platform, interior cushions, microwave/stove/refrigerator and more. 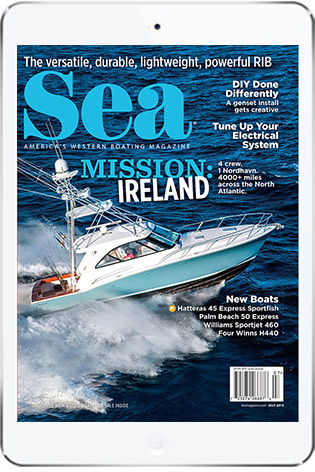 Electronics package, custom hull colors, crew quarters, joystick IPS control in cockpit, foredeck Bimini, air conditioning, Glendinning CableMaster shorepower cord management, underwater LED lighting, ice-maker and more.